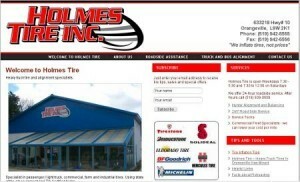 Case Study: Develop New Website And SEO Optimization for Holmes Tire Inc. Heavy truck tire specialists in Orangeville, ON. (Note – Holmes Tire is no longer in business to do an unfortunate work place accident). Business Name: Holmes Tire Inc.
Products And Services: Heavy truck, farm, and industrial tires and repairs. Heavy vehicle alignment and balancing. Emergency roadside assistance. One of the fun things about this business is that we get to learn more about other businesses and the products and services they provide. Prior to our work for Holmes Tire, I really never thought about how farmers and owners of industrial vehicles and heavy trucks had their tires repaired or replaced. Or how alignments were done on those same large vehicles. We had a lot of fun learning about the business of heavy truck tires! The staff at Holmes Tire were great to work with and helped us help them. We needed to understand their business, their clientele and the specialty services they provided in order to the best job possible. As most SEO specialists know, a great deal of search engine optimization is done externally of the website but good internal site optimization is required. As a new business, Holmes Tire’s first website was mostly a placeholder for their domain but they knew they could do a lot more with an improved site. We were appreciative that they chose us to help them with that task. After analyzing Holmes Tire’s competition on the Internet, we put together a website that focused on a variety of key words and phrases and created content around them. As well, a variety of external SEO techniques were employed over the course of several months. With the knowledge that many of Holmes Tire’s clients may be on the road and looking for their service, the website was also built with Internet enabled mobile device optimization. A Google map listing existed for the business but it was sparse with details. We assisted Holmes Tire in updating their Google Business listing which literally put them on the map for more of the specific services and products they provide. As of July 2010, Holmes Tire Inc held several #1 spots for relevant local search terms on Google.ca and top ten page 1 results for almost all of the other important search terms a potential client would be using to find the products and services that Holmes Tire offers. If you need heavy truck tire service, give the folk at Holmes Tire a call. They are great people and even offer truck and bus alignments too.